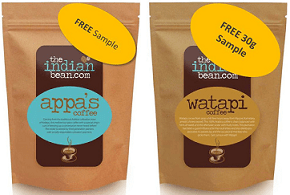 The Indian Bean is offering free coffee samples of Watapi and Appa Coffee.You can get a 30g bag of watapi or Appa absolutely FREE. Get the Sample free for a limited time period only. You can go back to the site and order more if you like the coffee’s taste after using the free coffee samples. 1. Go for appa’s 30g pack | watapi 30g pack free coffee samples. 3. Login or register yourself. Buying beans can be expensive, yes, but only if you’re one of those who believe that we just don’t get great coffee in India. Or perhaps you just haven’t been able to find any good Indian beans. That’s where we come in – we traveled around the countryside, from Nepal to the hidden hills of Kodagu and Kodi, and found a treasure trove of awesome Indian coffee beans; we met a bunch of brilliant people who grow this coffee and are building a community that supports indigenous and socially conscious farming practices.We want to promote and sell Indian coffee because we think it’s great.We want to make sure we have the best standards of quality, using the most cost-effective methods possible to distribute the best coffee from single farm owners in India across the country. Offer is closed now. It will be back again some time. Then we will update the post. We just provide information about the free samples and how you can get them. Follow the steps provided in the post above to get it. Sample will be sent by the product owners.